I have previously discussed a number of space power technologies which will allow humans to tap massive, non-polluting, non-depleting power flows (see #5, #33, #51, and #104). In the mid to long term, it is these technologies which will allow humans to escape the fate of overshoot/die-off like "yeast in a petri dish". "131. JD STill Masturbating to Star Trek"
Resorting to ad hominems just makes you sound like an idiot. "Lunar Solar Power" is a fantasy of unprecedent magnitude and totally out of the realm of reality. I could easily think of a dozen other space based ideas that are completely impractical, but a thousand times more practical than the LSP idea. The easiest one would be just send some spaceships to Uranus and carry us back some methane for us to burn. There's plenty there so all we need is build some powerful spaceships, or build enough of them. Certainly the idea is IMPOSSIBLE, but at least 1000 times more practical than LSP. The proposed LSP, generating 100 GW power at a cost of $400 billion, is roughly $4 per watts. That's slightly more expensive than setting up convensional solar panels on the earth ground. Why go to the moon when you already have technology setting up existing solar panels here on the earth at less cost? Now, 100GW provides only 16 watts per capital for the earth's population, so it barely provides a small scratch of the energy we consume today. You need a thousand such systems to provide the amount of energy we use today, which is a thousand times $400 billion, i.e., $400 trillion, 10 times the world's total GDP, or $70K per person. To generate 100GW of solar power, you needs to set up a structure on the moon which has a surface area of at least 1x10^9 square meter, assuming it has the efficiency of collecting 100 watts per square meter, which is reasonable since the solar radiation is 1360watts/m^2, and the efficiency of 7% is reasonable. How big is 1x10^9 m^2? It would be 36 km in diameter. We have never even build a structure on the earth that has a surface any where neat that size. The biggest focusing surface we have ever build has a diameter of 300 meters. And how much will such a huge structure weight? How much energy does it take to lift such a huge mass from the earth to the moon, and set it up, and how much fossil fuel we need to burn to have enught energy to deliver such a huge amount of mass to the moon? My very rough estimate is it would cost the fossil fuel of a few thousands of earth's worth!!! And not to meantion that how could you set up a 36,000 meter diameter structure on the mooon for the budget of only $400 billion. That's the same amount of money spend on the original Apollo, in today's dollar, just to send a structure a few meters across, to the moon. An earlier post talked about sending robots to construct everything out of lunar materials. I would like to compliment you, however, on offering a factual criticism instead of "OMGS JD R TEH GEEK!" You don't launch the entire structure from earth, people. If you do this, you launch sufficient resources to establish refineries on the moon. The moon is rich in metals just waiting to be processed. Also, heavy lift vehicles can lift large sections of a lunar craft into orbit, assemble it there, and then lift successive payloads of fuel. Such a craft, launched from orbit (already at 5 miles per second orbital speed) has far less energy needs to reach 7 miles per second required to leave orbit. Finally, the initial mission does not have to be engineered to return. 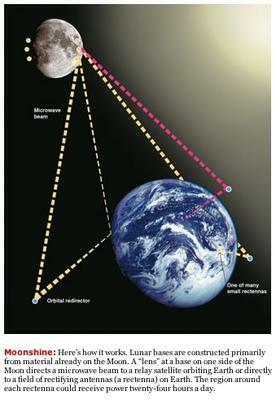 Successive missions can establish the round-trip process while the initial mission establishes the core lunar base. As materials are refined, the base is built out, more personnel are added, larger processing stations are built and then the lunar base can build its own launch system which can be done without rockets, using magnetic rail systems in a vacuum to achieve orbital speeds to launch payloads towards earth. The entire problem has been studied to death and has been doable since the mid-1970s. The only reason that it has not been done is choice - our politicians felt that buying votes from constituents was more important than advancing the security of the US (and the world) by addressing the energy problem up front. And I mean both parties here, not one or the other. Both parties have been very remiss over the last 30 years since the energy problem was clearly identified back then by Dr. M. King Hubbert himself, and the space-based solutions were described by people like T.A. Heppenheimer (amongst others). The core problem here is not whether we can do it but whether we will choose to do it. It cannot be done overnight and will require decades of time and hundreds of billions in investment to bring to fruition. Do we have that much time left? And will our politicians choose this solution early enough to allow it to happen? I don't know about the rest of you but my faith in our politicians is not high in recent years. I have a better plan: turn death valley into a giant solar/sterling generator array. Much cheaper. Space exploration and colonization is a great idea, but to do it for the purpose of energy generation for the people of Earth is just plain silly. It reminds me of corn ethanol. For the same money and more importantly, energy expenditure, we could set up geothermal power generation right here on earth. Then there is solar thermal electric generation in the American southwest.